1. "But will my dog still protect me?" 2. "When is the best time to start Dog Training the Natural Way?" 3. "Why don't we see Pam on TV so much any more?" 4. "How long does Natural Dog Training take to get results?" 5. "Can Natural Dog Training cure all behaviour problems?" 6. "How much will Natural Dog Training cost?" 7. "Will my children also be able to learn to Dog Whisper?" 8. "Do you make personal visits beyond the Western Cape ? 8. When is the best time to start Dog Training the Natural Way ? 9. "I don't suppose you train cats as well, do you?" 10. What other animals have you trained The Natural Way? This is one very spunky and innovative little Yorkie that was given to Pam by a vet after having been found with both his back legs injured in an accident. Yes, he did recover the use of both back legs - but in the meantime, he did not let life get him down! 11. "Can even my dog be trained The Natural Way?" 12 "What got you started with Natural Dog Training?" 13. "Have you ever had any failures?" Dog owners say the darndest things! “My dog was sick so I took him to the vegetarian”. “My vet says my dog has arithmetics”. “My vet took out my dog’s tentacles”. “My dog is so ugly that when she’s in season, the other dogs all run away from her!" ....And our pets - do they say the darndest things...? Our parrot said "Who's there..??" ...and the intruder fled. Dog owning is a relationship. "But will my dog still protect me?" Yes, of course your dog will still protect you! In fact, even more so. Dogs that bark at, and even bite family members and everyone who visits us are not being protective. (Unless you have dangerous visitors and family members!) Proper protection comes from dog a) being clear headed enough to distinguish between friend and foe; b) our dog being courageous enough to stand up to an intruder, and c) our dogs being loyal toward their family. Naturally! Which are all included in the Dog Training and Dog Whispering Nature's Way courses. Unfortunately, artificial dog training actually causes adrenalin surges through over stimulating dogs (which is why so many dogs get "expelled" from obedience training classes). High adrenalin levels detract from mental clarity. And encouraging dog owners to make their dogs submit to them is, of course turning dogs cowardly. The fearfulness that makes dogs submit to their owners obviously causes dogs be fearful in other threatening situations as well. The solution is of course, to be a team with your dog, the way a pack of dogs is in the wild functions - with their leader being their Captain, and not their enemy, or their opponent. But when training your dog Nature's Way, you will automatically develop your dog's protective instinct - which is already built into the dog's DNA. All dogs naturally protect their territory (don't we all! ), their pack and their pack leader for the purpose of survival. When a dog firstly - understands us, and secondly - is clear headed (i.e. not high on adrenalin), then they automatically know the difference between what is normal and what is not normal, and act instinctively when they are needed to come to our defence. Many a dog has saved their loved one/s by acting intuitively even before their family realised that they were in danger. Pam included. Her dog Tandy who was brought up the Natural Way to be loyal and clear headed knew that Pam was in danger before she even remotely knew herself - and saved her life. When dogs are so called "protection trained" however, they are dependent on commands, so when their owner is being threatened, they may not be in a position to give their dog a command, or when they do - as in the case when Pam was in danger - it would be too late. So how do you bring up a dog to be loyal and clear headed - and therefore be a good watch dog? There is no space to write another book here! It is very easy, but you will have to unlearn the artificial misinformation that dog owners are fed in their daily diet on dog behaviour, and re-learn the (fascinating and empowering) Laws of the Jungle that govern the dog's protective instincts in the Ebook How to Own a Good Watchdog by Pam Whyte under Books/Other Books. "When is the best time to start Dog Training the Natural Way?" Pam Whyte sees all dogs from 8 weeks to old age. She has achieved startling results with dogs of 14 years of age. Of course, she prefers to cure the problems the moment they first start manifesting themselves. The myths and misperceptions that state: "Dogs will grow out of behaviour problems", "it is only puppy behaviour", "the dog is teething", cause problems to escalate, and be more difficult to cure. At best, they cause dog owners to miss out on so much pleasure that they could otherwise be getting from their dogs. Dogs don't grow out of behaviour problems - the cause must be removed. "Why don't we see Pam on TV so much any more?" Pam needs to protect the privacy of her family as well as her own, so she seldom accepts invitations for guest appearances on television. With a website, however, this also works well, as she is still able to help and to be in touch with dog owners around the world. "How long does Natural Dog Training take to get results?" An afternoon is all it normally takes for the family to learn how to "speak dog language", which is very simple, and very exciting. Once you know how dogs communicate naturally can connect with him properly be getting onto his wavelength, so to speak, and bring him under control astonishingly quickly. Not unlike speaking English to an English person instead of Japanese - the change in our behaviour will be amazing! "Can Natural Dog Training cure all behavior problems?" What humans regard as misbehaviour is often a natural activity in the "wrong" place at the "wrong" time. For example, when a dog's adrenalin is running too high, they bark at other dogs. When their adrenalin levels are down, dogs in the wild do not "network" with each other in this way. It can also be, for example, that our dog not interpreting our words and actions the way we expect him to (dogs are not humans). So by learning Nature's Formula for Obedience, therefore, you learn how dogs actually perceive our actions - and how to can create an environment in which your dog learns to choose appropriate behaviour, rather than avoid punishment through fear, or expect to be bribed. The way dogs in the wild, where unity is strength, naturally cooperate with their leader. "How much will Natural Dog Training cost? " The investment of your time is far less than traditional drilling requires, and you recover much - if not all (or more than) your investment through being informed, and therefore empowered. You also have this knowledge for all future dogs - in the same way that you do not have to learn to drive a car every time you buy a new one or learn to speak French every time you meet a French person! Dogs under the age of 6 months cost less than adult dogs. Two, three, ten, twenty dogs are all trained for the price of one. (Because they all speak the same language.) For example, Pam cured 17 dogs of chasing horses and their riders that rode past her client's farm in an afternoon, by connecting with the leader dog, and all the other dogs followed his example. "Will my children also be able to learn to Dog Whisper? " Yes. Natural Dog Training also includes the children. Because it uses communication in place of force, Natural Dog Training can even be used by young children - as can be seen in the Home Movie Before and After Learning Dog Language. Pam tells families two things: One, the most important family member (the dog being a family member), is the youngest child. The dog must be 100% trustworthy and gentle around all babies and toddlers, even when adults are not present. It is not possible or practical never to leave a child alone with a dog. The dog must fit in with them, not the other way around. All children should be able to play, run, leave toys on the floor - and the dog must not have any desire or urge to chase them or to chew their toys. The onus is not on the child to be safe around dogs. It is on the dog to be safe around children - and this is all easily, quickly and gently achieved when Nature's Formula for Obedience is applied. Dogs in the wild are all gentle with their puppies when they are "out of survival" - which of course, is what Dog Whispering Nature's Way uniquely teaches. Next, Pam tells families - if the strongest person in the family or the one who can shout the loudest can handle the dog, (the way conventional dog training teaches) then he or she had better stay at home all day in case they are needed to control their dog! (Then who is going to go to work to earn money to buy the dog his food!) But if the youngest member of the family can control the dog - then so can Mom and Dad. Sound impossible? When using conventional "ruk, pluk, bliksem 'n bribe" methods - yes, then it is. But when we understand our dogs and work with their instincts instead of against them - it is not at all impossible. In fact, it's child's play! Pam achieves this every day. "Do you make personal visits around the whole country?" Yes. Pam will visit anywhere in the Global Village if her traveling costs are covered. However, dog owners get amazing results from other resources, such as her Home Natural Dog Training Kit, her book, booklets and Natural Dog Training Home Movies which are far more cost effective. "I don't suppose you train cats as well, do you....?" Yes, Pam corrects problem behavior in cats on a regular basis. Except she does not call them cats. She calls them Bonsai lions. She finds that cats' social instincts are far more highly developed than people give them credit for. (They just don't want us to know it.) They are very clever, and often team up with "naughty" dogs in a way families would never suspect. Pam cures such problems such as messing inside, making a habit of getting stuck in trees and on roofs, eating disorders, fighting their companions, for example. Extreme cases are where one cat ate the duvet, and one that bit the baby. Cats are generally very underestimated. In many of the homes that Pam is called in to, the "dog hates the cat". Or so it appears. The dog is chasing the cat, so it is automatically presumed that the cat is scared of the dog. Well, Pam wants to know... "If the cat is so scared of the dog, why then does he choose to jump down on the floor right in front of the dog...?" (For the sport, actually.) So, it turns out that it is the cat that is needing the training. "What other animals have you trained"
Pam has worked with horses, meercats, monkeys, parrots, wolves, camels, Dingoes, (including her own which she had to rehabilitate), wild dogs. The horses have just been small problems, like refusing to be bridled. Parrots are usually for screeching problems, occasionally for sudden refusal to talk. One meercat that Pam worked with was being chased by the family dog, so she was called in to teach the dog not to chase the meercat. It turned out that the meercat, who was enjoying the sport (as well as being rescued) was the problem! And one of the camels that Pam worked with was aggressive so that no one could ride him. She was due to ride him, and thought it may be a good idea to do therapy on him first! It worked, and the handler adopted the technique himself. Working with animals is all about establishing a rapport, getting a connection, and winning their trust. Animals have emotions that are very similar to peoples' - and therefore need love, companionship, empathy and to be understood just as much as we do. "Can even my dog be trained The Natural Way?" Yes. The dog's original pack instincts are present in all domestic dogs. For over 35 years, Pam has been successfully applying the natural principles that govern dog behaviour to all breeds of dogs from 6 weeks to 16 years to cure all behaviour problems. Within breeds, however, there are different dynamics, like working instincts, "short fuses", a natural willingness, stubbornness, which Pam includes, channels and explains, while working with families. 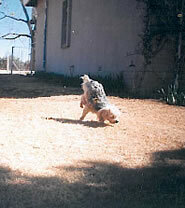 Everything Natural Dog Training teaches is empirical. Empirical in that these scientific facts have all been thoroughly tried, tested and proven over long periods within the dog’s own natural habitat (i.e. where the dog lives and interacts with his family, and with other pets - not in army-simulated situations such as at dog training, or in laboratories). "Are you the same as - "....who's that guy on TV...?" No - the main difference is - Pam gives away her secrets (and the dogs' - and they have many). She shows you exactly how the change in the dog's behaviour is achieved - and places the power in your hands so that you can achieve the same results. If you do not know as much as Pam does about dog behaviour at the end of the session (and that is a lot!) - you will not be able to maintain your dog's good behaviour after she has left. And if you do - you will be able to communicate with and control all dogs in future. "What got you started with Natural Dog Training?" "Have you ever had any failures?"